Definition at line 37 of file lltransfersourcefile.h. Definition at line 156 of file lltransfersourcefile.cpp. Definition at line 41 of file lltransfersourcefile.h. Definition at line 49 of file lltransfersourcefile.h. Definition at line 46 of file lltransfersourcefile.h. Referenced by LLTransferSourceFile::completionCallback(), and LLTransferSourceFile::initTransfer(). Definition at line 161 of file lltransfersourcefile.cpp. References mDeleteOnCompletion, mFilename, LLDataPacker::packString(), and LLDataPacker::packU8(). Definition at line 48 of file lltransfersourcefile.h. Definition at line 45 of file lltransfersourcefile.h. 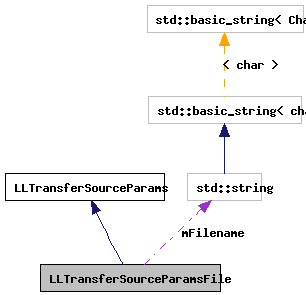 Definition at line 168 of file lltransfersourcefile.cpp. References llendl, llinfos, mDeleteOnCompletion, mFilename, TRUE, LLDataPacker::unpackString(), and LLDataPacker::unpackU8(). Definition at line 53 of file lltransfersourcefile.h. Referenced by getDeleteOnCompletion(), packParams(), setDeleteOnCompletion(), and unpackParams(). Definition at line 51 of file lltransfersourcefile.h. Referenced by getFilename(), packParams(), setFilename(), and unpackParams().